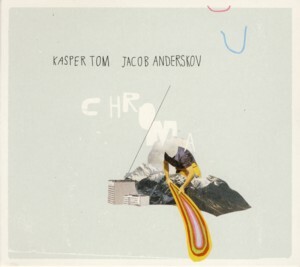 This is an album by a duo of Danish Jazz musicians: drummer / composer Kasper Tom ChristiansenFind albums by this artist and pianist / composer Jacob AnderskovFind albums by this artist, both representatives of the new wave of Danish Jazz music, which has been experiencing a significant resurgence since the turn of the Millennium. Anderskov, who is commonly recognized as one of the leaders of the local Danish scene, is a prolific performer, composer and recording artists with a sizeable legacy of over twenty releases as a leader since his debut in 2001 and many more as a sideman. He won the Danish Jazz Composer of the Year award in 2013 and is definitely an Artist worth following. Christiansen, who started to record in 2007, participated in more than ten releases since, with a steady progress towards excellence. This album includes eight original compositions, seven of which are by Christiansen, and the opening track is a piece credited to both participants. This is a very intimate piece of music, humble in a way, somewhat minimalistic, and yet it contains more music and artistic expression that most other, much more flamboyant recordings. For me this is one of the most profound pieces of music I´ve had the pleasure to hear this year. As usual in such occasions, I simply raise my imaginary hat, thanking the Artists for sharing.